Passion is the word of the week in one of my art groups. No, I'm not talking about the latest perfume. Or actions prompted by whiffing the latest perfume. In my opinion, your real passion is expressed in what you do. We all have things that noone has to tell us to do, we will do them no matter what. You don't do them under compulsion - actions borne of passion are ones that grow from you. Some people have a "passion" for fishing, baseball, singing, painting...or doll-making. We do these things without any prompting from someone else. It's so appropriate in the days before Easter to talk about passion. Because we, the humans of the earth, are the recipients of Christ's passion. In His life, His ministry, His death, he expressed his passion and love for us. In Paul's letter to the Philippians he said of Jesus, "When the time came, he set aside the privileges of deity and took on the status of a slave, became human! Having become human, he stayed human. It was an incredibly humbling process. He didn't claim special privileges. Instead, he lived a selfless, obedient life and then died a selfless, obedient death—and the worst kind of death at that—a crucifixion." For those who follow Christ, this week we remember Jesus' death on a cross. And on Easter we will celebrate his rising from the dead. Passion. What a wonderful, thought provoking & well written post. Your writing is so articulate. Kudos. Wonderful post and appropriate for Holy Week! Lovely post, and once again it is well-written. 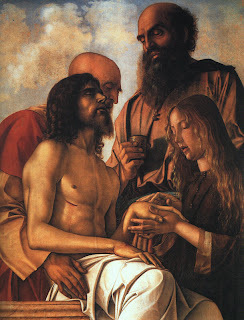 I love your post and the photo of Bellini's Pieta. Thanks for helping us all to remember why we are blessed with creativity. All blessings come from our Creator! Your "passion" always shows... in your beautiful creations and in your words. I love the art history & the Biblical history - so beautiful and always a welcomed message to my heart.